The Skinny: Fun performances from Chow Yun-Fat and Cherie Chung enliven this typical Lunar New Year Comedy. Before he created Milkyway Image, Johnnie To teamed with producer Raymond Wong to bring us this typical piece of New Year fluff. Bearing the usual three guy/three girl formula, Eighth Happiness is your standard break-up/make-up/all-out wackiness flick that packed movie houses back in the eighties. 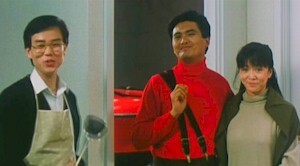 Chow Yun-Fat stars as a player who acts gay to score with the chicks. Raymond Wong and Jacky Cheung are the brothers. The women are Dodo Cheng, Fung Bo-Bo, and Fennie Yuen. I won’t bother with the plot. They all want each other, but obstacles arise that make things difficult. In ninety minutes, it’ll all be solved.